Coolingman works to bring the creative and persuasive powers of the artistic community to bear on the challenge of climate change by providing ideas and funding for artworks exploring climate-related themes (at Burning Man or elsewhere). Coolingman is seeking collaborators to manifest ‘OneWatt‘ at Burning Man 2018. OneWatt will demonstrate this effect, based on a concept put forth by James Hansen of NASA. 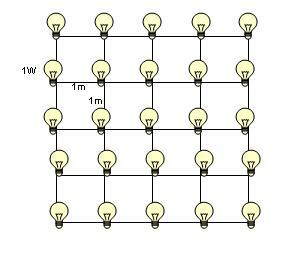 The vision is a grid of 1W incandescent bulbs on the ground, spaced 1 meter apart. Viewers would physically experience climate change effects by interacting with the bulbs light and heat. Funding potentially available based on ultimate project vision and need. Inspired by the National Debt Clock, The Climate Clock provides a ticking timer showing approximate real-time atmospheric ppm CO2e, with links to projected impacts at various levels of future ppm. The clock is an online application that will be used initially to feed desktop installations, then physical installations world-wide. Funding potentially available based on project vision and budget. © 2016. CoolingMan. All Rights Reserved.